The highly acclaimed Sky-Watcher Skymax-127 optic now with the AZ-GTi goto wifi mount, it has been designed to be controlled wirelessly with your Smartphone or Tablet, using the free SynScan App for iOS or Android. The AZ-GTi mount, with it's built-in WiFi module, creates its very own Wi-Fi network, so the mount can be used anywhere, without the need for WiFi or mobile networks. After following a simple alignment procedure, you are ready to explore the universe using the Apps intuitive touchscreen menu. "We took a tour of various targets, taking in Uranus and Neptune, open cluster M45 in Taurus and the Double Cluster in Perseus, the latter just fitting in the view using the 25mm eyepiece. The Dumbbell Nebula in Vulpecula had a nice glow to it, while the Ring Nebula in Lyra lived up to its name when glimpsed through the 10mm eyepiece. On another night we saw the Moon was replete with cratered detail along the terminator using both eyepieces, and each one is certainly capable of revealing fine detail, such as lunar domes and rilles. This is a fun system to use. Although there is an option to connect a SynScan hand controller, to get the most of this setup its worth downloading the SynScan app for your smartphone." The AZ-GTi and SynScan App provides full computerised GO-TO control, allowing the telescope to be automatically slewed to any one of the objects in the Apps extensive database of 10,000+ celestial objects. Incorporates Sky-Watchers Freedom-Find patented Dual-Encoder Technology, which allows the telescope to be moved manually in either axis without the mount losing its positional information. This gives the user enormous freedom, convenience and flexibility during observational sessions. The compact but powerful Skymax-127 telescope is ideal for the observation of double-stars, and the surface detail of the Moon & bright planets. Its high-resolution, long focal length optical system is multi-coated to maximise contrast and image sharpness. The 127 Mak has been available for several years building a fine reputation for excellent views, now with the superb AZ-GTI mount for easy goto operation. Total 10,000+ Objects. Deep Sky Objects: 10759, including Messier, NGC, IC, Caldwell Catalogues, Named DSOs, Named Stars: 305, Double Stars: 55, Solar system objects: 7 planets, Sun , Moon. (Unlimited objects when working with a 3rd party planetarium software). ASCOM platform for Windows PC, Mobile planetarium App for iOS and Android (SkySafari Plus/Pro, more are coming). The highly acclaimed Sky-Watcher Skymax-127 optic now with the AZ-GTi goto wifi mount, it has been designed to be controlled wirelessly with your Smartphone or Tablet, using the free SynScan App for iOS or Android. 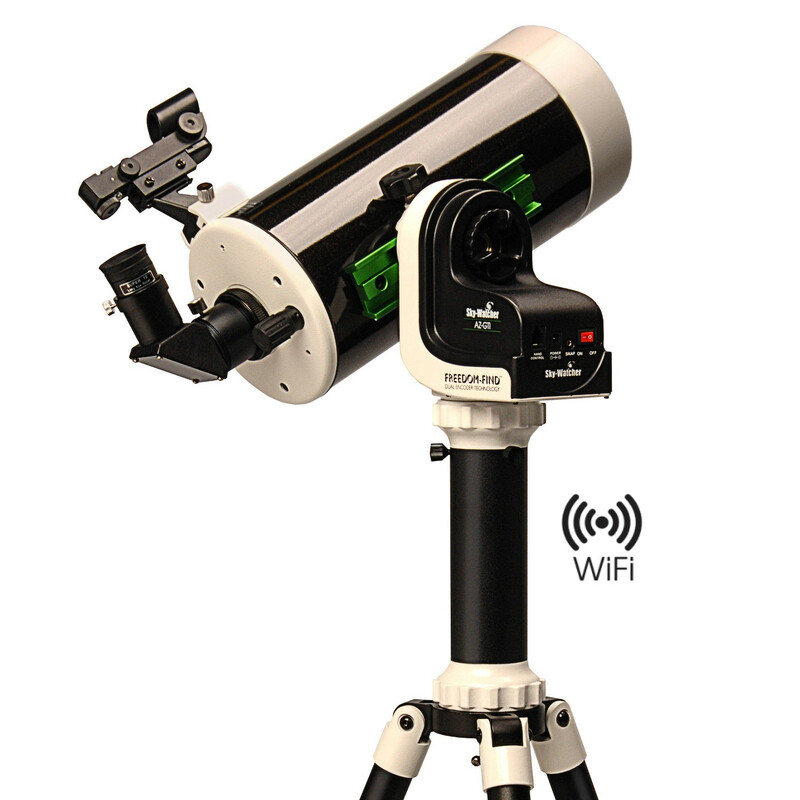 The AZ-GTi mount, with it's built-in WiFi module, creates its own Wi-Fi network, so this telescopet can be used anywhere, without the need for WiFi or mobile networks. After following a simple alignment procedure, you are ready to explore the universe using the Apps intuitive touchscreen menu. Supplied with tripod, mount, finder, diagonal and two 1.25" eyepieces as a complete package.